A brief note: I'm having computer crash issues when I try to create posts and when visiting blogs so I'm falling behind, but once they're resolved I'll do my best to catch up with all of you ... eventually. 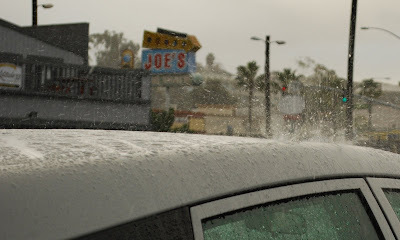 Love your photos but my favorite is that drops of rain on top of the car, it's very awesome shot very unique! Your pics are pretty nice shots. Happy blue Monday. Pretty just pretty. Happy Mellow Yellow Monday. Mine is up. I love seeing palm trees. Happy Blue Monday! Your pictures are awesome! 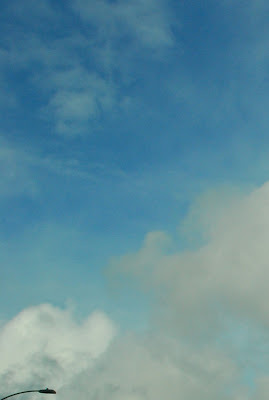 I love the sky shots. What a great group of photos, I love the Rusty Pelican shots. A seafood restaurant named Joe's seems so right, the colorful awnings appeal to me - lunch in the warm and non-rainy season must be in order. The rowers in red work well as a team. The UK style phone booths ('telephone box' I believe) are unique, the look of the past so classic. You capture an eclectic mix of rubies! There is a rowing channel in my home town. Your photos made me miss home. So many terrific shots supporting all these memes! Way to go! 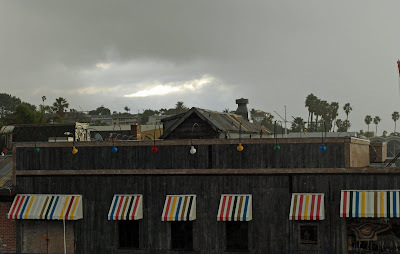 A couple of my favorites are the colorful awnings and lights and then those rain shots and the phone booth - wonderful shots! Hope your computer issues get solved more sooner than later. Interesting reds for Ruby Tuesday, Storyteller. I love the old fashioned red phone booth. The capture of the rain drops splattering is wonderful. Splash! 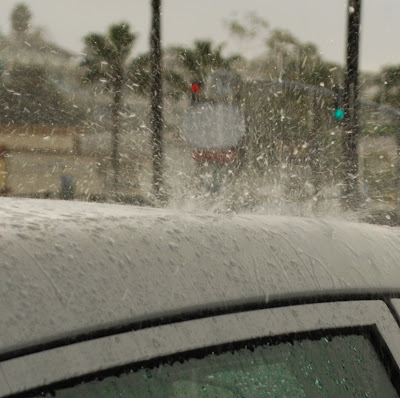 seeing the water splash of the car is wicked what a great shot! Was that a phone booth? Are you sure it wasn't the tardis? Did I see a glimpse of Dr. Who? Lovely photos! You are real pro! If you watch that phone booth long enouugh, Superman may come out. Not a great day for rowing. Love the raindrop spatter shot. 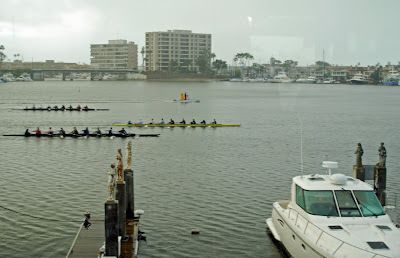 Neat pictures, I love watching rowing. It's so smooth and beautiful... I will enjoy the Winter Olympics this year, but I also love the Summer Olympics. That's where I see the rowing. How's the tennis games going? You got some great pictures! I really like the photos of the raindrops bouncing off the car roof. I'm sorry to hear about your computer problems. I don't think anything is more aggravating. I was just about to say those rowers remind me of the Thames and then I saw the phone box lol. your photos are beautiful, the pretty coloured awnings, the statues, the rain bouncing of the car bonnet and the beautiful clouds, you captured this day perfectly. 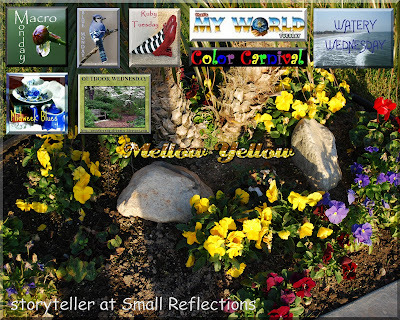 The Monday meme mosaic is an added bonus too :-), such pretty little flowers, Kathy. I love the rainy window! And, those window awnings are too cute...great photos despite the gray days of last week! 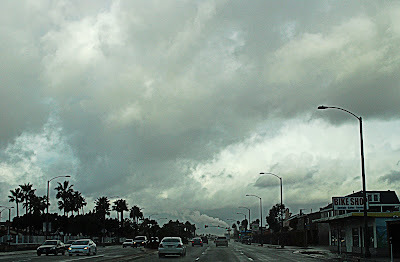 They are all so beautiful, but I most especially love the raindrops bouncing off the car...delightful!! 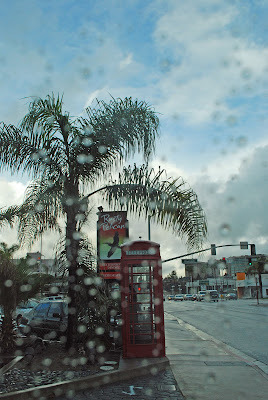 The colorful awnings and lights do look cheerful and I love the raindrops and red phone booth! A really great series of beautiful photos, especially the rowers, the strped blinds and the rain on the roof. What a great post! How on earth did you get those splashes? Did you use a motion setting? The phone booth is quickly becoming extinct, so that's a cheery picture of a dying breed. Oh, my those clouds are ominous in that one photo, what is that factory in the foreground? Love the striped awnings! Got you yesterday for your water today it is the fantastic red phone booth we don't have that here in the SFV you must be special! 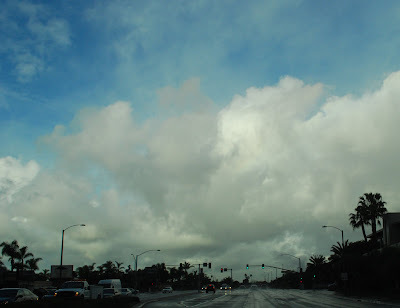 So glad you got some blue skies between the raindrops! We welcomed blue skies today! So nice to soak it in. The drops on the roof are neat!! You have some great shots for all the memes this week. The red phone booth reminds me of London. Really nice shots. 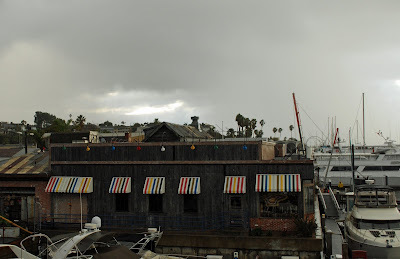 That Rusty Pelican has been one of my favorite restaurants for about 35 years. 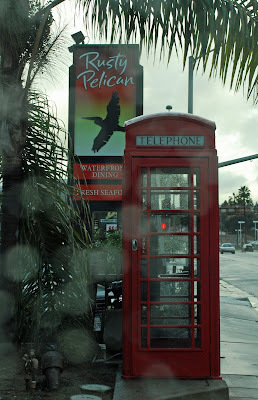 I almost stopped to take a picture of the red phone booth last week but it was raining too hard. Now I feel like a wimp. 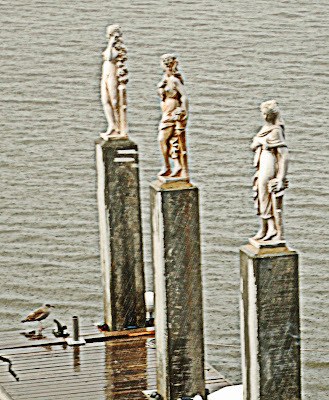 those dock statues look out of place-- I don't know why. weird! You captured a lot of weather and a lot of memes in one post. The reain is good, but I'm selfish, I hope it will abate while we are in the Southland and our son and DIL are camping. That's a great collection of photos. I love the ones of the rowers, and especially the shots of the rain on the car roof. Those are really cool! I completely enjoyed your poetry along with your wonderful photo journal! I love the dancing, splattering, rain drops! Also, the rowers always are intriguing! Such stamina! Wow they are pretty shot. Happy watery Wednesday. Mine is up. Very good to combine all the meme's together with such an ecclectic collection of photos. My favorites: the stripped awnings, the red ( English style) phone booth, the raindrops splashing on top of the car, the rowers in colors of red, blue. Eveyrthing! Perhaps you have listed in your sidebar, what type of digital cameras that you have. I dropped my digital Canon a520 last week and browsing for another that uses the Sandisk. I learned about buying an External Harddrive for the computer to back up data from a twenty something, and that it's better to use an Apple computer; less crashes. I love the striped awnings! reminds me of candy canes! Wow, that really is some heavy rain. I love how you captured the drops. 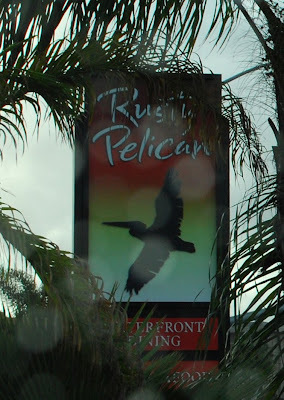 As for the Rusty Pelican, it was one of my favorite places to eat in Miami, Florida! I love the macro shot of the rain! 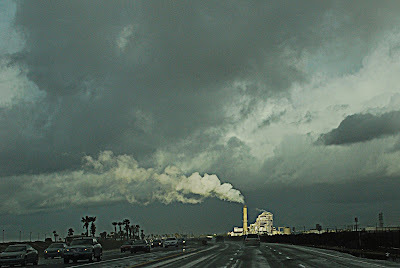 I love that red phone booth, and the factory smoke in the stormy sky. 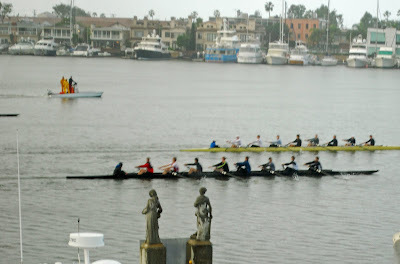 The rowers on the bay look like they're serious about making good time!